In each of the books I have read about building tiny houses on a trailer, the first step is to level the trailer. And it is. It’s the first step, yet none of them really go into much more depth than one sentence, maybe two. It’s important to level the trailer. Sounds simple enough. In the end it wasn’t that complicated, but it wasn’t that straightforward either. 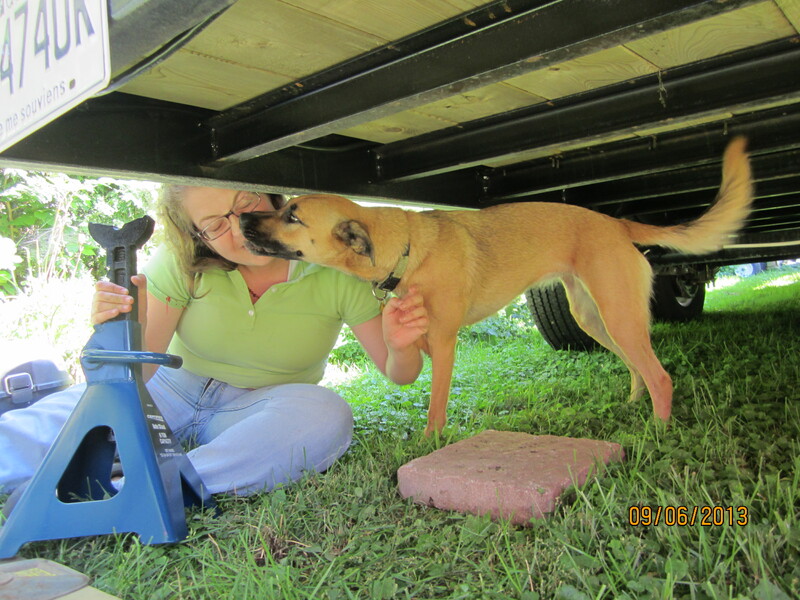 Clover helping me set the jacks under the trailer. It should be noted the jack in the picture was the jack that I had to return. The stabilizing jacks that I ended up buying are different. I had read on someone’s blog that they went to Canadian Tire and bought axle jacks. I could see how an axle jack could work, unfortunately for me, it didn’t work all that well. The axle jacks was able to purchase do not have the ability to adjust their height in small increments. In order to adjust in small increments you would either have to use shims or shift the placement of the jack along the frame of the trailer. I wanted my axle jacks to be placed on the inner part of the trailer so that I don’t kick them or trip over the paving stones I put them on as I am building. I am not keen on the idea of using shims particularly since the difference in height I needed ranged from 1/2″ to 1 1/2″, that’s an awful lot of shim. The only shim I could find of that size is a metal shim used for log splitting, they are heavy and the one I saw was rusty. No thank you. Back to the drawing board or the internet to find a stabilizing jack that can handle upwards of 7 tonnes. I was able to find such a beautiful thing at an RV supply store 30 minutes from my build. I bought 4 jacks. I also scoped some tire covers and other fun RV items, but they will have to wait for another day. Another helpful and though not completely straightforward hint, use a laser level. I used laser levels in different context when I was working in theatre as a stage manager. We used them to help tape out any given production’s set on the floor, but never to level a trailer. My dad set up one of his laser levels on a camera tripod and we went about levelling the trailer. He has a very handy bumper jack and we used his jack in conjunction with the jack built into the tongue of the trailer to raise each of the 4 corners of the trailer to place the stabilizing jacks and lower the trailer back onto the stabilizing jacks. It took several times raising and lowering the stabilizing jacks to get the trailer level. We checked for level with the laser light on a camera stand and by measuring the distance on the diagonal angles (corner to corner) to make sure they were the same. We achieved level.